End of Law St. in PB – site of future lifeguard center. Photo by Mic Porte. Hello, I’m Micaela Shafer Porte, born and raised in PB, MBHS class of ’77, member of the PB Town council, Friends of Mission Bay Marshes, PB Library, etc, and ProtectPB.org. I write to you with serious concerns about the proposed construction of 4000 sq ft of concrete of a large lifeguard station in the middle of the Law Street canyon and beach next to Palisades Park in North PB. This $7 million project also includes hundreds of sq ft of “plastification” of the beach with “armor flex, a plastic grid driveway – to accommodate heavy trucks and machinery in the regular tidal events that happen on Law St beach. 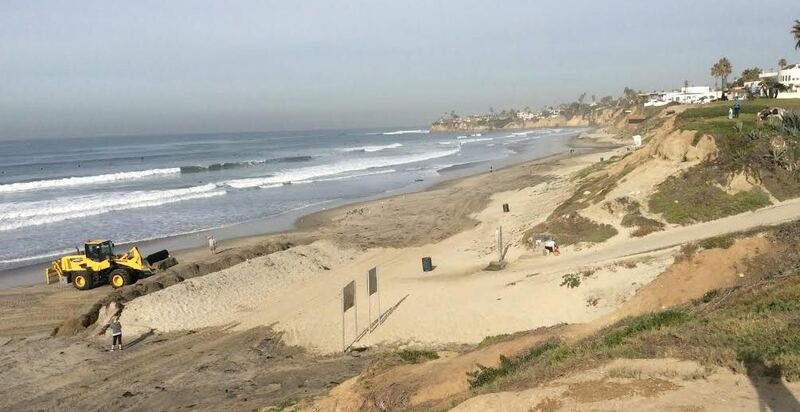 We have formed a citizen’s committee online called protectpb.org, with a petition, to defend this stretch of beach from this massive development. Protect PB is not against lifeguarding on this beach, we are against the excessiveness of this design, and the ill-fated location choice in a blind run off canyon in the high tide zone that is the end of Law St. beach. We just lost one round at the most recent PB Planning Committee meeting on December 1. Law Street Canyon Beach is a beautiful self-sustaining beach and view that everybody loves. We urge the PB planners and the City – please do not vote to extend “the street” into the beach with this project! We attended every meeting and sub-committee meeting for over a year (2011/12) to express protests and concerns, and agreed together with the PB Planning Group sub-committee, the local concerned citizens – and the lifeguards, that the city would minimize the project like at La Jolla Shores. The lifeguards said,”measure our stuff and build us that.” Three years later, the project reemerged last July 2015 – bigger and more expensive by $3 million. A double concrete ceiling (with a foot of air space between) for the underground locker rooms will effectively impair any natural vegetation to grow. A 14ft high garage, (another thing the lifeguards thought was too high in the Grand Ave station which does not allow them to use that above space for storage, of surfboards, for example)…. Because the city planners are fixated on delivering a model emergency vehicle storage facility to fire-rescue standards (for a fire truck) they must build a high un-useable space for the lifeguards on an acre of rare beach. We do not find this adapted, logical or eco-logical considering this unique site. We think parking city machinery on the beach is the worst possible place to store it, considering the damp salt air that rusts out everything immediately, and that we are killing our beach by turning it into a street and parking lot. That the lifeguard’s primary concern is visibility to the beach and this design is mostly blind to the most crowded south part the beach, with full visibility only in the tower (80sqft) is another concern we have with this careless design. The lifeguards themselves should reject the lack of ocean/beach visibility in this plan. For you mothers, the concentrated storm water run off pollution will probably end up resembling the section by the Grand Ave Station, an open ditch right onto our favorite family beach. We say “probably” because the plans are vague about that part…”The trenches” is what we call the Grand Ave.Station in the winter months, and that will become our beach at Law St. most of the year. The “complete destruction of the coastal cliff landscaping” that is planned on top on the double concrete ceiling to hide the underground bunker in the canyon is scheduled to have fertilizers and herbicides and enriched dirt and artificial irrigation, all to run off onto the beach, so while you can’t water your yard, we will be watering the beach eco-system with a lot of un-natural stuff. These are just a few of our concerns with these plans and dis-respect of the beach AND the essential needs of the lifeguards, to create this oversized, over-priced, inefficient construction project. This section of ocean has been declared a natural preserve since several years from The Point to Diamond St. and this beach should be too. “We don’t even know if we have grunion spawning on this beach anymore,” said a representative of Scripps Aquarium. And Professor Karen Martin, California grunion expert from Pepperdine University condemned San Diego beach management practices as highly destructive to any beach ecosystem, and specifically to the unique local species that is the grunion, in her book Beach-Spawning Fishes, Reproduction in an Endangered Ecosystem. Although San Diego Parks claims to practice the “grunion protocol” that she established, I can say with photographic proof, that they do not, and millions of grunion have disappeared from our beaches maybe forever. The original site for this project from 2002 was at Diamond Street, a wider beach, in the lee of the pier, and with more people. Other propositions from the planning group include a facility on stilts for minimal impact on the beach ecosystem and parking/storage at Tourmaline Surf Parking lot. scrap this project and get in new planners who actually listen to the clients, and have some respect for the beach. “Don’t you want a monument on your beach?” asked the city architect at the sub-committee meeting in September. Well, Pacific Beach, do you? Check out our site, protectpb.org, and read some of your other neighbors’ comments… Please Sign our petition to block this project and re-consider better options for effective, comfortable lifeguarding and respect for the future of our beach. Or say good bye forever to this view and this beach at the end of Law St. It lifeguard station looks appropriate to me. It fits in well with the lay of the land. How some NIMBY can protest a lifeguard station is beyond me. 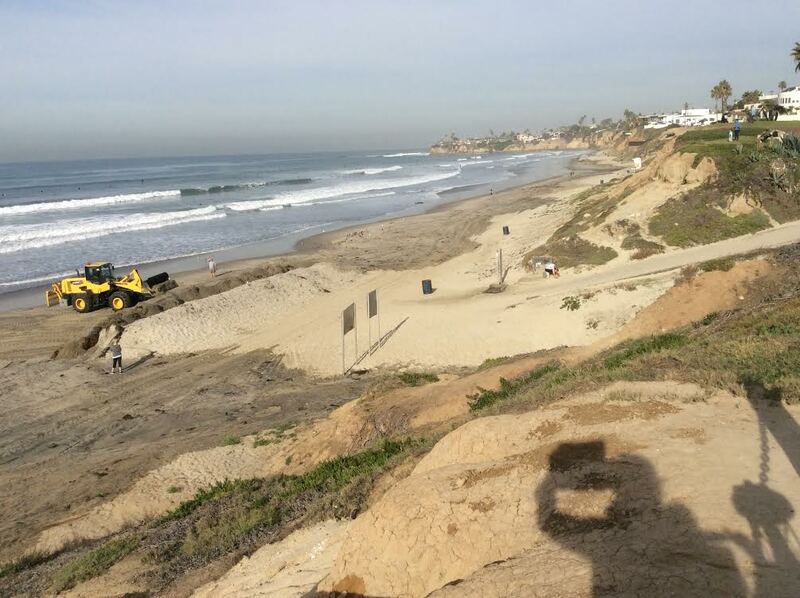 San Diego beaches are for everyone, and we will all lose a lot of beach for the people with this project. This is not a “backyard”, (NIMBY: not in my back yard) but everyone’s front yard: San Diego beaches, the finest in the world. Check out the erosion on the beaches in Mission and North PB right now. This project is delusional. What are the problems this is supposed to solve? Seems a small lifeguard station that fits “their stuff” would suffice. Argue the philosophy of the issue primarily, only then the details. If you’re focused on the weeds of details, they’ve got you – then there’s a “compromise” position in there somewhere that’s just as wrong. Wrong is wrong – this monster project is the wrong answer to modest needs. Put a raised chair on the bluff, with an umbrella. This low impact/cost; and increases lifeguard interaction with the people. Needless construction increases erosion, and reduces the natural view! Increase life guard pay & benefits: they do guard your life!